Gov. 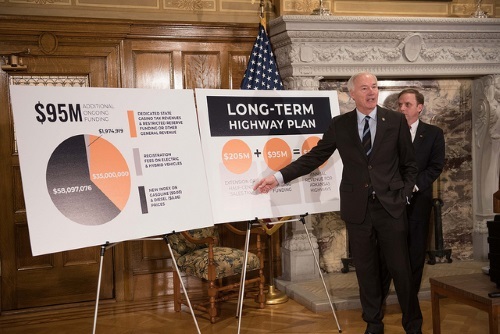 Asa Hutchinson (R) and Arkansas legislators issued a proposed two-part $300 million long-term highway funding plan on Feb. 11; a plan they said would represent the largest in Arkansas’s history. The first part of the funding plan extends a half-cent sales tax imposed in 2012 through 2020 – a tax expected to generate more than $205.5 million a year. Roughly 28 percent of the current revenue accrued via the half-cent sales tax goes towards paying off bonds for road projects. By extending the half-cent sales tax, the state would be able to shift to a “pay as we go” system, Gov. Hutchinson noted in a press conference this week. The second part of the plan’s funding – representing a little over $95 million – relies on three different revenue streams. The first is a three-cent and six-cent increase, respectively, in the state’s gasoline and diesel fuel taxes, which would generate a net of more than $58 million. Second, new and additional registration fees for hybrid and electric vehicles are expected to generate more than $1.97 million annually. Finally, dedicated casino tax revenues backstopped initially by monies from the state’s general fund adds in at a minimum $35 million. Gov. Hutchinson noted during the press conference that in addition to the half-cent sales tax extension, other components of this plan – such as the registration fees on hybrid and electric vehicles and the casino tax revenues – offer “future growth potential,” meaning their “upward trajectory” would provide more “funding certainty” for Arkansas’ highway program where none previously existed. In addition to the $300 million those efforts will generate for state highway need, Gov. Hutchinson said Arkansas cities and counties will receive $110 million annually to help maintain local streets and roads.